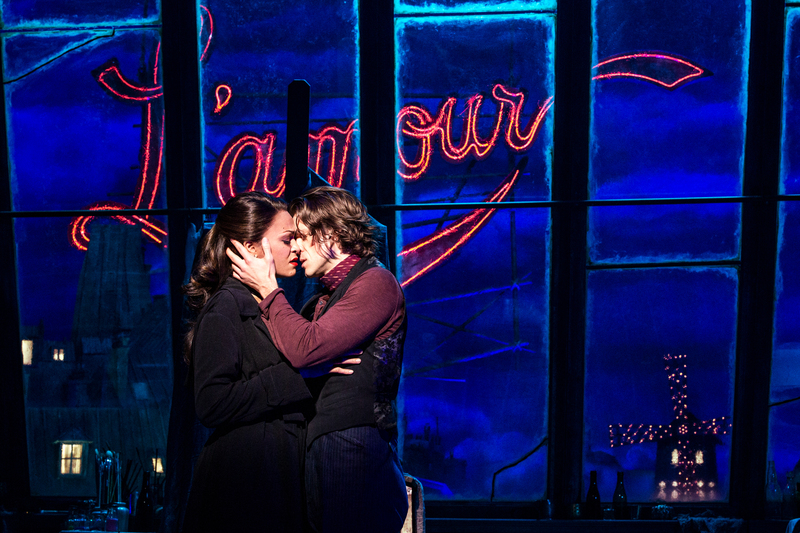 ‘Moulin Rouge’: Is it a love story or a music video? BOSTON – “Moulin Rouge! 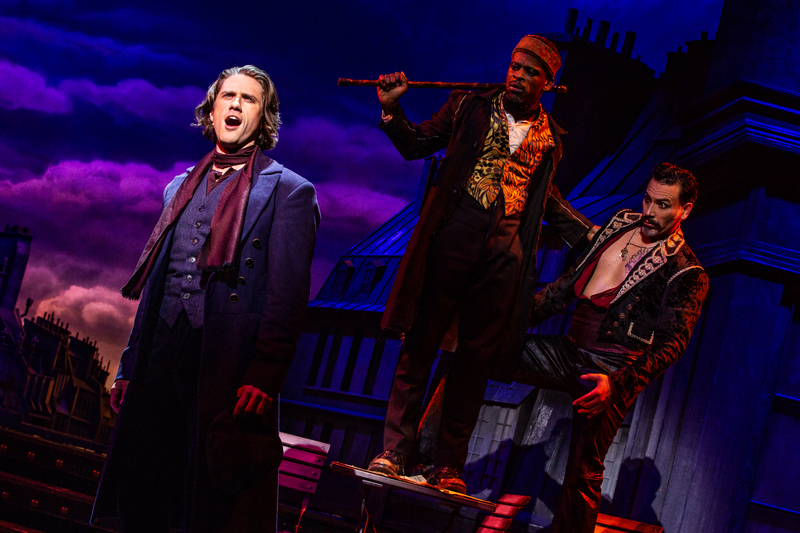 The Musical” seems to have some great things going for it in its world premiere production at the Emerson Colonial Theatre on the way to Broadway, with a scheduled landing date of next summer. If only it had …. a flashier set. I jest, of course..Tony Award-winning set designer Derek McLane has taken what appeared to be an unlimited budget and over-spent it. The jaw-dropping set co-stars with a cast of 31, and sparkling costumes and choreography. In 25 years of reviewing theater in the Greater Boston area I’ve never seen anything like this set. It is a stage to ceiling creation, complete with a windmill to the left and an elephant to the right of the stage, both reaching to the sky. Theater-goers were not being prevented from taking videos or movies of it, as the producers,had released photos several weeks ago. McLane has also designed other impossibly romantic sites, such as a sitting room high above the Moulin Rouge. Also part of the story is the re-opening of the beloved Colonial, leased by the London-based Ambassador Theatre Group, and the Distinguished Lady of Boston has been spiffed up, with new seats and carpeting, new heating and cooling systems with an eye towards re-making it as a regular stop for shows on the way to Broadway. 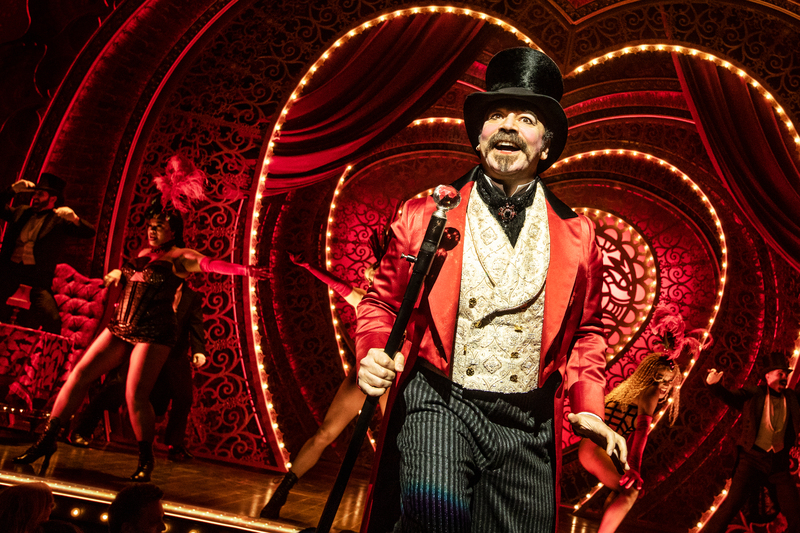 The musical is based on the Baz Luhrmann 2001 film “Moulin Rouge,” starring Ewan McGregor and Nicole Kidman which has had a devoted cult following and grossed $179 million worldwide. The musical is as free-spirited a work as the movie, with a madcap collection of music paired with Sonya Tayeh’s throbbing, sleek, choreography, often performed by the scantily-clad dancers of the Moulin Rouge. An extensive variety of musical genres and popular music from the last 50 years is melded with original music from the movie. Elton John plays a prominent role and Sahr Ngaujah as Toulouse-Lautrec channeling Sammy Davis Jr. is a hoot. “Come What May” is the signature song brought over from the movie that gets heavy play. The musical does try and tell a story most of the time – except when it doesn’t. It is La Belle Epoque in Paris, at the turn of the 20th Century, and in the Bohemian Montmarte section of Paris, a club called the Moulin Rouge celebrates a eclectic collection of characters who call it home, including a proprietor/ringmaster named Harold Zidler (Danny Burstein, with more than a wink and a nod to the Emcee in “Cabaret.”). A young American composer named Christian (Aaron Tveit) meets the cabaret actress Satine (Karen Olivo), the star of the Moulin Rouge who descends from the sky into his life. The club is struggling, though, threatening to put all who work there back on the street, so Sidler makes a deal with the devil to give Satine up to the Duke of Monroth (Tam Mutu), who holds both the club and Satine hostage. The Duke agrees to bankroll a new show starring Satine with Christian’s music, directed by the brilliant but starving Toulouse-Lautrec (Sahr Ngaujah) and featuring Santiago (Ricky Rojas), almost as good with the ladies as he is at the tango. The audience sits back and lets it all wash over them. I was decidedly in the minority at the recent press premiere in thinking that it was just too much. Director Alex Timbers declared in an earlier interview the work was “deluxe maximalism” and I would say he was understating things. The New York Times reported that the Sydney, Australia-based firm Global Creatures is spending up to $28 million to stage “Moulin Rouge” and I’m sure a construction accident that delayed the opening hasn’t helped. Hey, if things don’t work out, the producers could just sell tours of the set. Some will come to the Colonial strictly for the dazzling, drop-dead gorgeous tableaus, including an exquisite presentation of the Boulevard Beaumarchais. The biggest problem with the show is that it can’t decide whether it’s a love story or a music video. Timbers doubles down on the throbbing score and frenetic choreography, and instead of one scoop of what you asked for,you always get two.